Raccoons Rags: Progress on the Jedi outfit. 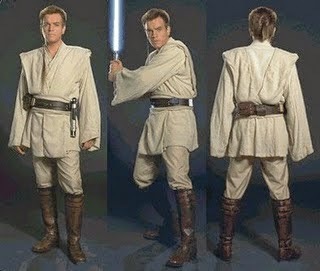 Worked out how to make the waistcoat-type garment that goes over the Jedi tunic yesterday. I sewed so much! My fingers were sore, but I just had to finish it. Here's the ensemble together. It's damp in the picture. I wetted the garments under the tap to a) remove all the vanishing ink and b) style the over-garment so it hung properly. Now at the back, I believe that Obi Wan's over-waistcoat ends at the belt, from the outfit on my action figure (which is impressively accurate) and from the only picture I've managed to find. But I like the look of the two pieces of fabric falling below the tunic hem, so I've made mine like this. I left it all overnight to dry out, and this morning tackled the belts. first there's a wide fabric one, like the kind that fastens a kimono, over that is the leather utility belt. I was tempted to use my spare one for my Jedi and call it quits, but for the scale of the lightsabre hilt. My lightsabre chopsticks arrived today and they're just about perfect for the 17" body. The 12" scale hilt is just as long, but is thinner than the hilt on the chopsticks, so it doesn't look quite right. So I ended up making my own belt. I had some kid leather in the same colour as the boots. It looks almost black here, but is a dark brown. It's not as detailed or as cool as the smaller scale belt, but I had fun and it looks kinda good. The clasp in the centre was something I couldn't really reproduce, so I've just added a twist of wire and made some tiny D-rings to embellish it. The lightsabre hilt should clip on to the belt, but I'm really a seamstress, not a modeller, so I've made a loop for it to slide into. It's looking better and better. To be honest, I only wanted to make a robe in the beginning, because I'm into coats and capes, but it's been a pleasurable digression. The boots I'm using for him are not tall enough up the leg. Jedi boots are knee-high.) So I'm currently attempting to make some gaiters in exactly the same colour leather. As I've said before you are very clever... it's looking fab... and you're making a jolly good go of being a modeller as well!!! This is brilliant and drapes just perfectly. I have a confession to make: I might just be the only person on the planet who has not watched Star Wars!!!!! OMG! You must be the last person on Earth, lol. I grew up on Sci fi, so I'm a total geek. I was a sci-fi kid too but there was something about Star Wars that just didn`t appeal to me.